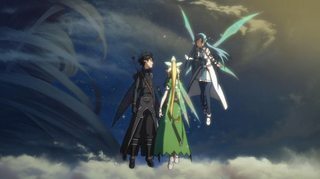 At the end of Sword Art Online (episode 25, ~21:40), Kirito says something in the presence of Leafa, Yui, and Asuna. Despite being shown his lips moving, there is no sound and so the only hint is how his lips move. Since my knowledge of Japanese is far from extensive, I don't have the ability to read what his lips are saying. 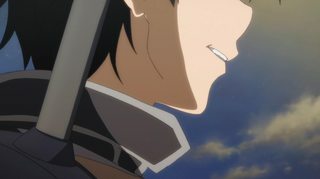 What is it that Kirito said to the others in this final episode? With his penetrating gaze, Kirito glanced at Aincrad for a moment, and then cast his eyes downward. His lips moved. It seemed as though he had said somebody's name in a faint voice - but [Yui] couldn't hear him. In light of this, it is clear that Kirito said somebody's name. It seems, however, that the author chose to leave the identity of the person ambiguous. I believe that the standard inference among the SAO fanbase is that Kirito said either Sachi's name or Kayaba Akihiko's name. This seems like a reasonable guess to me, though I'm not sure if there's any other evidence supporting it. Which translated means "Thank you Kayaba Akihiko" I've played it over and over again and that's all I can get put of it. In addition to the other answers I would add some thoughts specifically on the anime. While I am not sure if it's the case, I would think that the animation was created in conformity with the authors ideas (i.e. they have decided jointly on this important scene). This means we can take those reactions as according to the canon, thus we can conclude more from them in addition to what is known from the manga. Kiritos eyes are not directed at the girls (they are floating slightly above), his head is tilted even or slightly downwards. They both had a (positively) surprised look on their face which did not change during the scene. Yui also seemd slightly surprised, but immediately became content and pleased. There was no blushing or other signs. Judging from Yui's behavior earlier, one could guess that he made a positive remark about (the relationship with) Asuna (pleasing Yui), while at the same time original enough to surprise both girls. What was changed into an immortal object?